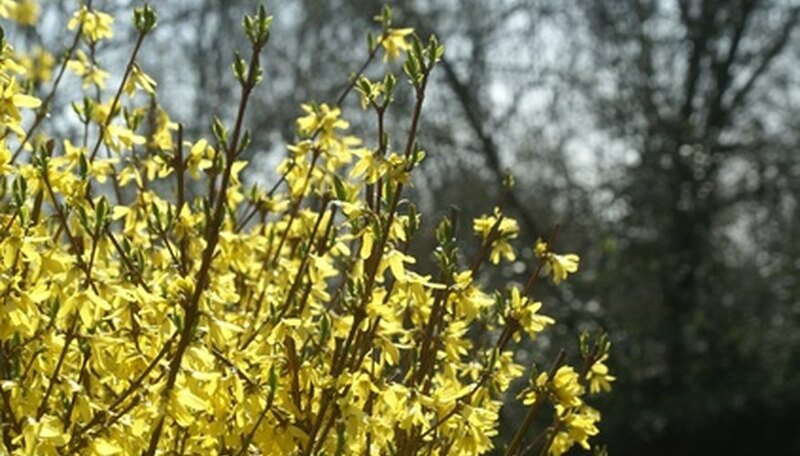 Hardwood cuttings are taken from plants and shrubs during the dormant period of the growing season, when there are no visible signs of growth. Hardwood does not easily bend, unlike soft wood cuttings or tip cuttings. The hardwood cuttings may come from second or even third-year growth. It can be difficult to root hardwood cuttings, but using a growth hormone aids in successful propagation. Wet potting soil with warm water and mix well. Do not allow the soil to become saturated, but maintain the consistency of a damp sponge. Fill the growing tray with the potting soil. Create uniform holes in the soil for the hardwood cuttings. Choose healthy plants from which to take hardwood cuttings. Examine the stems to determine where the leaf nodes are located. Leaf nodes look like little nubs on the stem. These nubs produce leaves during the growing season. Make a clean cut with pruning shears right under a leaf node. There must also be another leaf node located about 1 to 2 inches from the top of the hardwood cutting. Make the cutting at least 6 to 8 inches long. Take several cuttings to ensure success in propagating hardwood cuttings. According to F. E. Larsen, professor of Horticulture at Washington State University, the growth of “one-year-old shoots” yield several cuttings for propagation. Make a small slice, 1 inch in length, down either side of the basal end of the hardwood cuttings. Professor Larsen states this wounding technique makes the cuttings more prone to rooting. Pour 1 tbsp. of rooting hormone into a plastic baggie. Dip the basal end of the hardwood cuttings into the rooting hormone and shake off any excess powder. Place the cuttings into the growing tray and firmly tamp down the soil around each cutting. Cover the growing tray with clear plastic wrap to form a miniature greenhouse. Place the entire container in a sunny location that's free from direct sunlight. Check the hardwood cuttings daily and mist with a spray bottle of water when the soil dries out. Re-pot the cuttings to individual pots once a solid root system has formed--anywhere from two weeks to two months, depending on the plant variety. Harden off the new plants by setting the plants outside as weather permits. Grow the plants outside in containers for the first year, then transplant into the landscape the following season.